In simplest terms, a trust is a legal agreement between at least three parties: the trustmaker, the trustee, and one or more beneficiaries. The trustmaker is the individual who creates the trust agreement and is also sometimes referred to as the grantor, trustor, or settlor. The trustmaker then transfers ownership of certain assets to the trust, and the trustee manages those assets for the benefit of the beneficiary or beneficiaries. In most cases, the trustmaker, trustee, and beneficiary are all the same person with a revocable living trust. The trust agreement might cite additional beneficiaries as well who will inherit from the trust after the trustmaker's death. The two most common purposes of a revocable living trust are to plan for mental disability and to avoid probate of the assets that the trustmaker funds into her trust. The creator of the trust can name someone else, called a "successor trustee," to take over management of the trust should she become mentally incapacitated. It avoids the necessity of having a court name a conservator or guardian to take over her financial affairs when she becomes unable to manage them herself. The most common use of an irrevocable trust is to move assets out of the trustmaker’s name and control to eventually transfer to the next generation for their use and enjoyment. This move also reduces the value of the trustmaker’s estate for estate tax purposes. A trustmaker typically cannot serve as trustee when he forms an irrevocable trust for this reason. You can't take your property back after you transfer it into an irrevocable trust. You can't undo or dissolve such a trust. Although the trustmaker of a revocable trust reserves the right to dissolve or change his trust at any time as long as he's mentally competent, an irrevocable trust is, for the most part, forever. Trusts can be designed to meet specific purposes and concerns. For example, an irrevocable life insurance trust (ILIT) holds only an insurance policy on the trustmaker's life. The policy is owned by the trust, so its proceeds are not generally included in the gross value of the decedent's estate for estate tax purposes. A special needs trust can be set up to provide for a disabled beneficiary in such a way that it doesn't compromise his entitlement to Supplemental Security or Medicaid benefits. Who Can Act as Trustee? One of the most distinct differences between revocable and irrevocable trusts concerns who acts as trustee or successor trustee. When spouses form a revocable trust together, they typically each act as successor trustee for the other when and if it becomes necessary. State laws generally don't dictate who can or cannot act as successor trustee or as the trustee of an irrevocable trust, and the terms of the trust document typically dictate what the trustee can or cannot do. But the decision still should be addressed thoughtfully. The individual must be able to manage trust assets in such a way that he doesn't lose money or have the funds decrease in value. He must deal with beneficiaries, often on an ongoing basis, which can require tact and diplomacy. 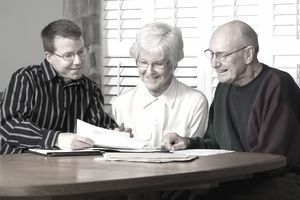 When the time comes, he must understand how to legally transfer trust assets to beneficiaries. The named individual should have the ability and knowledge to handle sometimes complex financial transactions and at least a rudimentary knowledge of state law as well. Some trustmakers name family members to this role, particularly as successor trustees, but this situation can present a host of problems. Naming one son or daughter over another can create friction and imply a sense of favoritism. You're effectively trusting this person to put all personal feelings aside when dealing with your beneficiaries, many of whom are probably also family members. Many trustmakers of irrevocable trusts appoint professional trustees for this reason—either a trust attorney, an investment firm or a bank. It takes personality and emotions out of the equation, but these entities don't work for free; their service might cost your trust quite a bit of money that would otherwise have been passed to your beneficiaries. A halfway measure might involve naming multiple co-trustees and requiring their unanimous agreement on any actions taken. It won't necessarily cut down on emotional friction, but you can at least be assured that decisions should be balanced. You might also name a family friend or business associate and leave your offspring and other family members out of any management roles. Why would anyone want to set up and fund a trust, particularly an irrevocable trust? Aside from the estate tax benefits of an irrevocable trust, these trusts also provide asset protection from creditors and lawsuits. They can help with Medicaid eligibility because they avoid the necessity of "spending down" assets; you've already transferred your assets into the trust, ideally well outside of the look-back period. And even revocable trusts can allow you to control bequests to beneficiaries, something that's not always possible with a last will and testament. You're free to set terms for who gets what and when and under what circumstances. Moreover, your successor trustee can manage your financial affairs for you if you should become unable to do so. If you want to form a trust for a specific concern or reason, speak with an estate planning attorney. Almost certainly, there's a type of trust out there to meet your needs.